Plans for York Central. Picture: York Central Partnership. A leading retail expert in York has said that a landmark scheme hoped to bring 6,500 jobs to one of the largest city centre brownfield sites in the UK “cannot be the sole answer” for future economic growth in the city. York and North Yorkshire Chamber of Commerce head, Susie Cawood, said the York Central plan presented a “once-in-a-generation opportunity”, but she urged the City of York Council to support other developments “with the same enthusiasm”. Councillors on Monday approved the scheme, which is set to create 2,500 homes, by a majority vote following a five-and-a-half-hour planning meeting. Mrs Cawood said: “We have all waited a long time for this once-in-a-generation opportunity to unlock the site and the public funding that will enable this large brownfield site to be delivered. 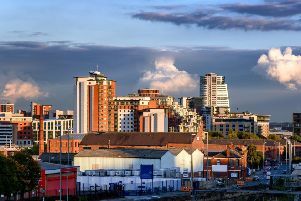 “The vision for new Grade-A offices in the city centre is one that we wholeheartedly support, which will help to attract new businesses and investors into the city, as well as allowing existing companies to grow. “However, we continue to believe that York Central cannot be the sole answer to the future economic development for the city, and we would urge the council to support other commercial and employment sites, with the same enthusiasm it has shown to the York Central proposals. Sean Bullick, managing director of marketing organisation Make It York, said: “Getting the design of the site right will be crucial, ensuring it is of the highest quality. With the world class architects and urban planners involved in the project, we have absolute confidence that the new development will complement both the existing on-site heritage and that of York more generally. York Central Partnership says that as well as 6,500 jobs, the residential, cultural and commercial space would add more than £1.16 billion to the city’s economy. Homes England, Network Rail, National Railway Museum and City of York Council, have worked together for the past four years on a £155m funding package for infrastructure works to unlock the brownfield land for development. Majority landowners Homes England and Network Rail are acting as “master developers” at the site to the west of the city’s railway station. Improved access routes, the country’s first railway park, and a new entrance to the station are planned.